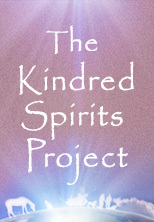 Kindred Spirits, Worry, Distraction or Awakening? Our animal companions can bring us such great joy, help relieve and heal the parts of us that experience depression and anxiety. They can help calm our hearts and minds when we get caught up in the concerns about our life challenges, lessons and all that is going on in the world. 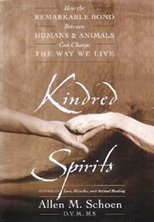 In my book, “Kindred Spirits”, I review the research up to 2000 on how they can help us heal. There is an abundance of new research that continues to document these beneficial healing effects. Some of us have a tendency to worry about almost everything in our lives from the smallest decisions to the greatest issues confronting our planet. I am aware that I certainly can have that tendency. Worry can manifest as true concern for an animal or it can just as easily and quickly take a wicked turn into anxiety and fear. As we shared in a recent post, fear can tend to generalize from one experience into many similar experiences both in humans and our animal friends. I find that that also can happen with worry. Worry, concern, anxiety are all just different manifestations of potential expressions along a wave of emotions. In each moment we can chose if we want to be aware of this concern and turn it into a productive, positive resolution to a particular issue or if we lose control of the emotion and it tumbles into worry and anxiety. Our animal companions can be great relievers of this worry, or they can be a cause of further worry and anxiety. One teacher of mine once shared with me one of my favorite insights: “We fill our lives with distraction until we die, unless we wake up”. As I have consciously tried to decipher if something will be a distraction or an opportunity to wake up, I realized that almost anything can be a distraction or an opportunity to wake up. The choice is ours in each and every moment. I see this with myself as a veterinarian. On the positive, constructive side, concern for my patients has stimulated me to be continuously search and explore for new healthy, nontoxic approaches to their health and well being when western medicine and surgery did not offer a reasonable option. On a less positive note, I remember many nights that I lay awake worrying about a particular patient, when I knew I had done all I could and the outcome was not in my control. I see this with my clients as well. Concern for their animals health and treatment for a particular condition can stimulate them to search for complementary and integrative approaches to their animals condition. On a less positive note, their reasonable and totally understandable can quickly turn into destructive emotions of worry and anxiety about their animals condition. This worry and anxiety can easily be destructive to them. It is not uncommon to then see that their animal companion may pick up on their worry and angst and it can impact on their own health. Chronic worry and anxiety impacts on our immune system as well as our animals. It is normal for parents to be concerned for their children’s well being, whether they are a human or an animal. That concern is an opportunity for us to be aware if it is normal healthy concern or if it is tipping towards worry and then anxiety. That is where we can have a choice and choose awakening to what is vs. worry about something that we may not have any control over. I especially see this with my animal cancer patients. 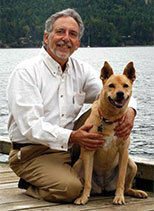 Clients often come to me in severe anxiety over the diagnosis of cancer in their animal companion. That is certainly understandable. They often will come with a guarded to poor prognosis by their regular veterinarian or an oncologist and say that they had said my dog or cat has been given only a few months to live. They ask if there is anything I can do. I usually agree with the oncologist stating that based on conventional medicine and surgery, that prognosis may indeed be true, but with the addition of an integrative approach we may be able to improve the quality and quantity of their lives. Knowing that there is some hope and reasonable options exist greatly relieves their anxiety. Sometimes, they will ask if they should worry about the prognosis. Occasionally, if appropriate I may jest, and say “sure, go ahead and worry” if that makes you feel better, but it won’t help your animal and it actually may impact on their immune system and their health”. They often times will respond with a chuckle and realize that the worry is indeed nonproductive and that by being more positive and loving they can actually, possibly help their animal companion’s response. They will then feel more part of the healing team that is doing all we can to help their kindred spirit. Worry can arise when we realize that we cannot predict what is going to happen and that we do not have full control over how events turn out. We humans are normally uncomfortable with not having absolute certainty. Incessant worrying can happen when we find it hard to let go. A fertile imagination causes one to play out mental scenarios of doom, failure, and fatal consequences over and over again. What can we do about this? Here are a few tips that I have found to be beneficial in transforming worry about our animal friends from distraction into awakening. 1. We can transform the worry into awareness and turn our mind from destructive emotions into more productive, positive thoughts. This may show up practically in our daily world as exploring other options for their health. These positive thoughts can create a more focused, compassionate approach to our animal’s care, improve both your and their immune system and well being. 2. Going for a walk in nature with your dog, or by yourself can help ground one and settle the mind so that one can think more calmly and clearly about the situation. 3. Meditation, creating a quieter, more peaceful inner world can be the most powerful, transformative action to relieve anxiety and worry. Whether it is a particular meditation technique or sound frequency meditation or whatever technique you find beneficial, quieting the mind is one of the healthiest approaches for all of us. 4. Sometimes, I will shift my energy simply by stating an affirmation to my subconscious mind such as “I am free of worry and anxiety in order to be of benefit to all beings”. Sometimes this is enough to shift my state of mind. Studies on functional mri’s on Tibetan monks have actually demonstrated that when we focus on being of benefit to others, it stimulates the area’s of joy and bliss in our prefrontal cortex. 5. In a quick pinch, sometimes when I am so “time-challenged” and busy that I barely have a moment to breathe and am feeling worry or angst showing up, I will stop for a moment, take in a slow, deep breath, and visualize my breath as a feeling of calm and deep peace. That can help change your angst into calm in one deep breath or one moment. 6. If the worry and angst continues to overwhelm you, you may want to look for some counseling or psychological support in dealing with the worry. With these appropriate approaches, we can turn the worry and angst about our animal friends into positive, more loving compassionate action for them and for ourselves. By transforming worry into compassionate action, we can be of more benefit to them, ourselves and expand that to the entire world! May all of us transform our worry into positive, compassionate thoughts and be of benefit to all beings!